How effective are middle managers at executing the strategic goals of a company? Salesforce and Government Business Council teamed up to find out. 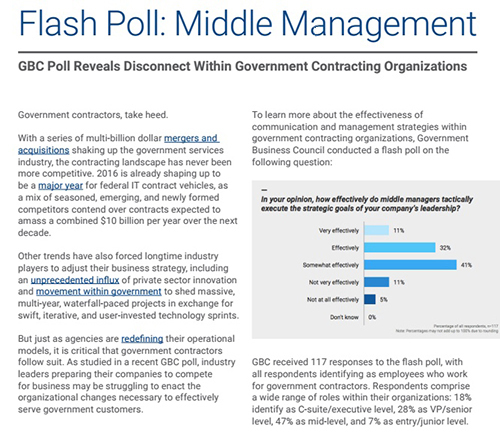 A quick poll of over 100 government contractors revealed a 23-point gap between senior leaders and middle managers on executing strategic goals. Download the report now. Learn about how cloud-based analytics from Salesforce can turn these trends into opportunity, empowering each and every employee to take on a data-driven approach that transforms the mission into a stronger, more effective operation.